The more heavily loaded a ship is, the lower it sits in the water. "Designated displacement" is a measurement the weight of water a ship displaces of when fully loaded and submerged to her load lines. 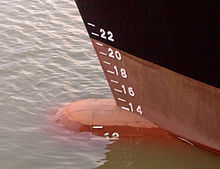 Displacement or displacement tonnage is the weight of water that a ship pushes aside when it is floating, which in turn is the weight of a ship (and its contents). It is usually applied to naval vessels rather than commercial ones, and is measured when the ship's fuel tanks are full and all stores are aboard. Merchant vessels use other measures such as net tonnage, gross tonnage, or deadweight tonnage. ↑ George, 2005, p. 68. This page was last changed on 14 January 2019, at 13:44.